A music fan born and bred in Leeds, I was ashamed to have never encountered Brudenell Social Club until now, in my mid-twenties. 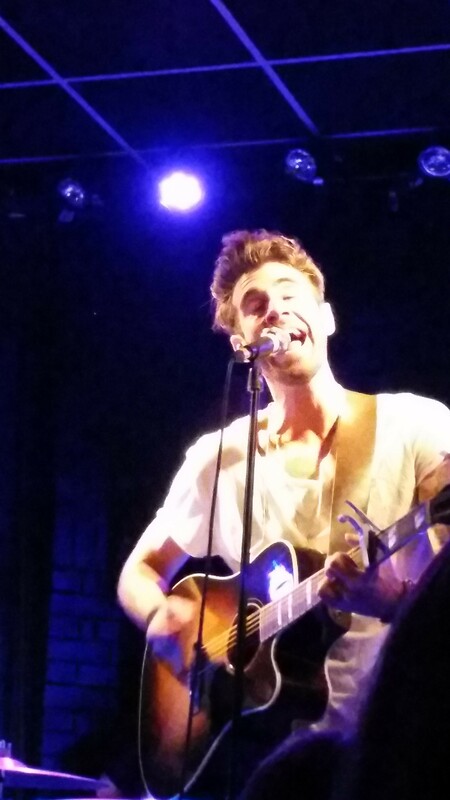 Tonight sees the arrival of American Authors, a 5-piece from Brooklyn, New York. To date mainly associated with providing the soundtrack to the Toyota Prius advert (‘Best Day of My Life’ in case you are wondering) as well as one of the more identifiable FIFA 2014 songs (‘Hit It’) it is chance for the alternative pop-rock outfit to showcase the rest of their talent in the iconic venue within the depths of Hyde Park, Leeds. First to hit the stage however is Mike Dignam. An acoustic-led feel-good folk/pop artist. Attracting the predominantly student crowd Mike’s songs tell stories of fun times and relationships – allowing the audience to clap cheer and sing along. A definite music act to watch over the next year. The break between the acts allows me to look around the venue. A more hexagonal (!) stage area that is sunken down in front of the traditional social club bar and seating. A welcome break from the modern music clubs in the centre and selling ales from £1.99, it is a more traditional setting. The acoustics are wonderful, simply echoing around the room. Playing through their album ‘Oh what a life’, including the occasional cover (Coldplay’s ‘Yellow’ and Sam Smith’s ‘Stay With Me’) frontman Zac Barnett’s energy is endless, evidently proving, should they need to, that they are a band more than capable of producing more than just a couple of ‘soundtrack’ hits. Naturally humouring the crowd about the English weather (Despite New York sitting under a blanket of snow!) it feels like one big party with friends, a complete carnival atmosphere. The band is quite frankly a delight to watch, genuinely loving what they do, and a breath of fresh air to liven the dank November evening. Returning to the stage for an encore, the band proceeds to invite the crowd to ‘stick around’ to chat after the gig. This alone restores my faith in the music industry. Since the closure of The Cockpit in Leeds I have been genuinely worried that venues such as Brudenell Social Club, would be forgotten about by artists. However, seeing a band like American Authors tonight with so much passion, leaves hope for the live music scene just yet.